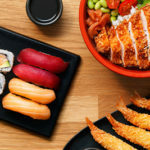 You Me Sushi has been delivering fresh sushi from its flagship store in Marylebone since 2008 and is the place in North West London to get fresh, sustainable sushi at great value. You Me Sushi deliver takeaway sushi all over Central London and beyond. Not only do we deliver but we warmly welcome customers to come and sit and relax in our sushi restaurant on Marylebone Road. Place your order for delivery or pick up on our menu page, enter your post code and order your delicious sushi takeaway, it is as easy as that! Alternatively, you can give us a call on 020 7935 0505. Have you recently ordered or dined at this branch? To see if we deliver to your area, enter your postcode below.